At Lake Montessori School, we are happy to offer an educational experience that is unlike any other school in Leesburg. 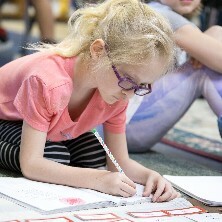 Because we are the only school in the area that subscribes to the Montessori philosophy, we are able to provide a unique learning environment where your child can thrive. If you have been curious about what our Montessori school in Leesburg offers over other educational environments, read on. At Lake Montessori School, we are committed to using the Montessori method to help our students become their best selves as contributing members of the community. If you are not familiar with the Montessori Method, it was created by Dr. Maria Montessori in the early 20th century. With a Montessori approach, education isn’t simply about passing information down from one generation to the next. It’s about developing character. The Montessori environment is designed to bring out a child’s natural curiosity of the world and to give them agency over the learning process. Instead of just memorizing facts, students are given the freedom to explore what naturally intrigues them, giving them the opportunity to develop a deeper relationship with their education. Building upon the child’s natural desire to learn, the Montessori method builds a child’s independence, curiosity, self-worth, and logic. 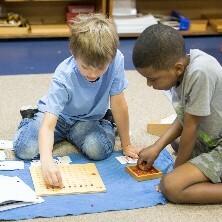 If a traditional educational environment is no longer serving your child, the Montessori method may be exactly what they need to become a successful learner. Browse our site to learn more about our Montessori school in Leesburg, and if you’re ready to get started, contact us about enrollment.